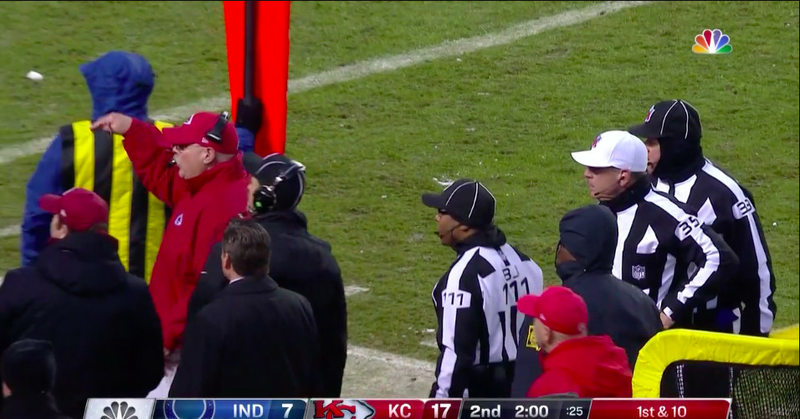 At the end of the Colts’ first drive of the game against the Chiefs, punter Rigoberto Sanchez was almost hit with a snowball. Aside from that fact that it was a pretty impressive throw (that’s like 25 yards, at least! ), it’s not the safest situation. Chiefs fans didn’t stop either. Late in the first half, more snowballs came flying from the stands and Kansas City’s head coach Andy Reid intervened. Reid could be seen telling the fans to use their head, and NBC cameras even caught some of the snowball tossing in action. The Chiefs jumped all over the Colts in the first half to take a 24-7 lead into halftime. The last thing Kansas City needs is for penalties to be assessed on the crowd at Arrowhead Stadium to give Indianapolis a chance to climb back into contention. Having Reid pissed at you can’t feel great either.